Use the two Monte Carlo simulations to anticipate how many tasks your team can finish during a defined period of time or when a certain number of tasks might be completed. Monte Carlo - How Мany? The "How Many" chart aims to tell you the minimum amount of items that you can get done within the next “x” days. For example, you can use it if you’ve got a product update scheduled for March 30th and you wish to know how many features you can finish by then. - Simulation input: define the time frame from the calendar picker and activate the percentiles (Select all) to get the probabilistic view of the chart. Some people prefer Bar chart to visualize the throughput instead of a Line chart -> use the Throughput Mode to define it. You can run more than 1 million trials -> to simulate trials use the Simulate More Trials button. Components: switch on/off the charts that you want to see. Filter for Current chart: choose values to select which items are available to this chart - this allows you to filter your account data. The first chart is "Throughput Basis" chart. The horizontal axis is a representation of time, while the vertical one shows the daily throughput. 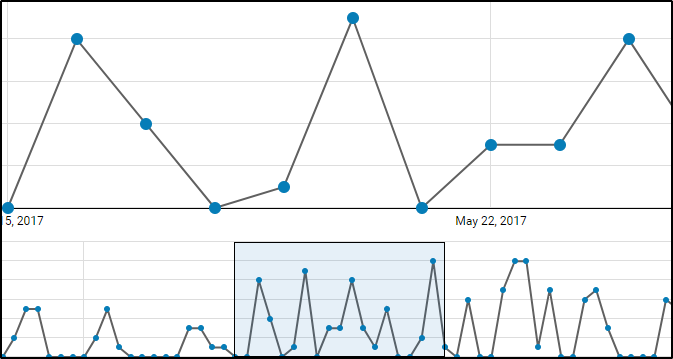 The high points of the charts represent the maximum throughput of any of the days in the chart; the low points represent the minimum number of tasks that were completed. Hovering over the dots will give you a summarized information about the number of tasks that have been completed that day. The line between the dots visualizes the rises and drops of the productivity. The Throughput Navigator allows you to zoom in and out of a specific interval within the selected time frame. This way you can generate different Monte Carlo simulation without having to reset the general time frame every time. Monte Carlo, which is the bottom chart is a direct visualization of the results of the simulation in the form of a probabilistic distribution. The horizontal axis visualizes the total work items that will probably be completed within the selected future time frame. The vertical axis shows how many instances of a certain result occurred during the trials. 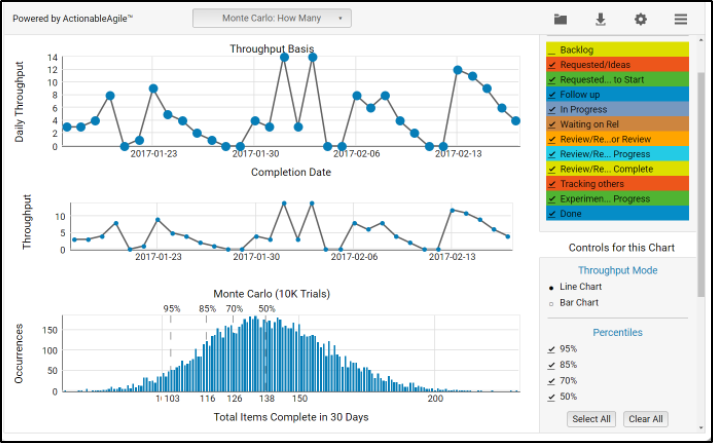 The Monte Carlo simulations in Kanbanize will run 10k trials to maximize the accuracy of their results. In other circumstances, a simulation may run fewer trials, depending on the scenario. The percentiles decreasing from left to right at the top edge of the chart represent the probability of any of the simulation results visualized below realizing itself within the future time frame.